Meerkat and Periscope aren’t the first tools to offer live-streaming capabilties, but they have captured attention due in large part to the ease with which they allow video to be recorded on the fly, from a smartphone, and shared publicly on Twitter. Twitter owns Periscope, while Meerkat is the indie player, a breakout hit at this year’s South by Southwest technology festival in Austin, Texas. And both are positioned to spawn a crop of disputes, and even lawsuits, around alleged privacy violations or copyright infringement. Some of these apps’ early users have transmitted videos from inside private homes, as they would with a standard webcam. But many others have used the apps in public places such as city streets, or while attending events like concerts or sports games, or from inside places of business. Before they hit “stream,” not every user asks for permission from the business, or from every other person they might record during the live broadcast. In the process of broadcasting, snippets of private conversations, copyrighted material, and other incidents may inevitably be picked up. “The immediacy changes things,” said Kerry O’Shea Gorgone, an attorney and expert in social media and marketing law, who hosts a weekly podcast on such matters. With other video recording apps, users have a chance to review the footage before it goes out, she said, but that is not so with Meerkat or Periscope. In most public places, privacy laws typically don’t protect people. Those laws would apply to new live streaming apps like they would to other recording apps, Gorgone said. Meerkat doesn’t archive its streams, making takedown notices pretty ineffective at stopping copyright infringement. Whether in public or private, however, everyone has what’s called a “right of publicity.” That means that any video recorded requires the permission of those shown in the video before it can be used for commercial purposes, whether it be for a social media post or a digital ad. There don’t seem to be any cases yet of brands running afoul of this on Meerkat or Periscope. But some companies are already taking an interest in how they might be able to use live streaming to their advantage. If a company uses a live stream app in a public setting for a commercial purpose, and does not obtain consent from people captured during the broadcast, those people would be within their rights to sue the company, said John Delaney, an attorney at the law firm Morrison Foerster who focuses on intellectual property and technology cases. At least one company has found itself in hot water here, though not with live streaming. Last year, actress Katherine Heigl sued Duane Reade after the pharmacy chain tweeted a photo of her shopping at one of its stores without her permission. She later dropped the suit after coming to a “mutually beneficial agreement” with the company. Copyright infringement is another area of concern with live streaming apps. Last week, HBO issued take-down notices to Periscope after people streamed the season five premier of its Game of Thrones show. Both Meerkat and Periscope forbid users in their terms of service from posting videos that would constitute copyright infringement. Live streaming a network’s broadcast of a show would violate that rule. But determining exactly what constitutes copyright infringement as it relates to live action in a public setting is far from clear. Courts have held that when a live event is essentially a performance of a work of authorship—like a theatrical production or a choreographed ballet—it is protected under copyright law. But, “Live streaming of sports games would not violate copyright as long as the games were not following choreography, and very few are, one hopes,” said Robert Brauneis, professor of law and codirector of the Intellectual Property Law Program at the George Washington University Law School in Washington, D.C. So, under copyright law, this means you’d be fine live streaming a home run by Billy Butler at an Oakland A’s game, but maybe not Bray Wyatt during a WrestleMania match, which is what Twitter cofounder Jack Dorsey did during that event in Santa Clara, California. Still, event promoters and broadcasters may adopt their own rules on live streaming by attendees during events, regardless of how the law applies to them. The NBA has decided to restrict both reporters and fans from live streaming game action with apps like Meerkat and Periscope. Representatives from the MLB, NHL, NFL, World Wresting Entertainment and Live Nation either declined or did not respond to comment on where they stood on live streaming during events. Theatrical group the Schubert Organization simply doesn’t allow any video recording. The MLB, however, will reportedly ”monitor” the use of such apps during games. People don’t have a right to privacy when they’re walking around in public, but if you’re Periscoping a live video for commercial purposes, you need permission from anyone seen on camera. Some might argue that the quality of mobile video taken with a live streaming app is not high enough to warrant legal action by a copyright holder. “But just because the video is bad, that doesn’t save you from liability for copyright violations or invasion of privacy,” said Gorgone, the attorney and podcaster. The video quality though may have a bearing on how much the accused is required to pay in damages, she said. Instead, what might save Meerkat or Periscope from liability—but not the end user—are the safe harbor provisions of the Digital Millennium Copyright Act. This is what has saved YouTube from paying monetary damages for copyrighted videos on its site, by arguing it’s nothing more than a third party hosting service for what end users decide to post. Under the provisions, YouTube and others like it are required to respond promptly to valid legal take-down requests from copyright holders. 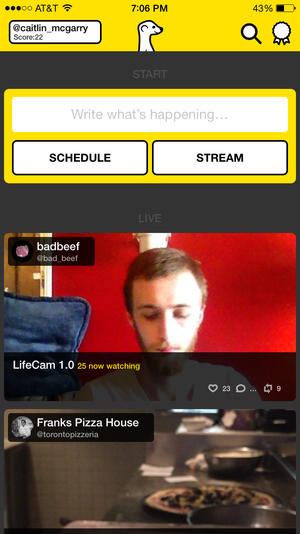 But as it stands now, videos on Meerkat disappear from the app after the broadcast. On Periscope, they stay up for 24 hours. This gives copyright holders a narrow window to file a take-down request. It’s still early days for mobile live streaming: the apps aren’t mainstream yet like Instagram or Facebook. But some tech-savvy entertainers have already latched on to them as a way to promote themselves and to connect with fans. 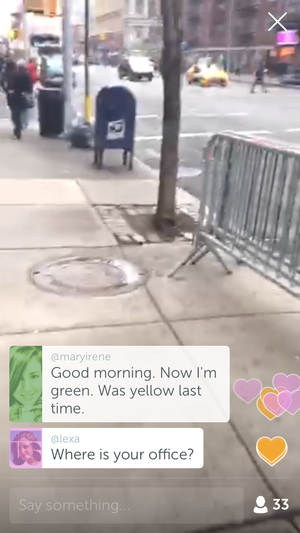 Jason Farone, a comedian based in Los Angeles, loves Periscope, and uses it throughout the day to record himself. People from other countries sometimes watch his broadcasts. Last week, however, he was kicked out of a Target store when he started live streaming there, while chatting up random customers and workers.